Welcome to Day 17 of 31 Ways to Embrace Lopsided Living! The posts for today and tomorrow are where I am right now. But they are also where so many women I know are as well. It’s called: BUSY. I recently said you to a friend I feel like I live at the intersection of Hectic Road and Frantic Avenue. Maybe you do too? Just over a year ago, I wrote a post titled Busy Women Welcome Here. Why? Because it seems like, especially in Christian circles, there are a whole lot of blog posts and books telling us we need to create margin, slow down, and do less — but not a lot of places to be encouraged when we’re in those very real seasons of busy. And, here’s what else I know, in fact, it’s the next important truth about Lopsided Living. Yep, you read that right! Do we need margin? Yes. Is rest important? Of course. But when we look at Scripture, we cannot ignore the very real examples of people who were busy. 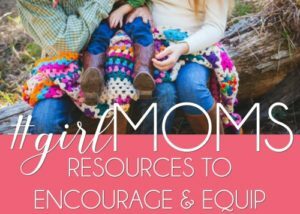 Jesus, the Proverbs 31 woman, Ruth, and Paul immediately come to mind for me. 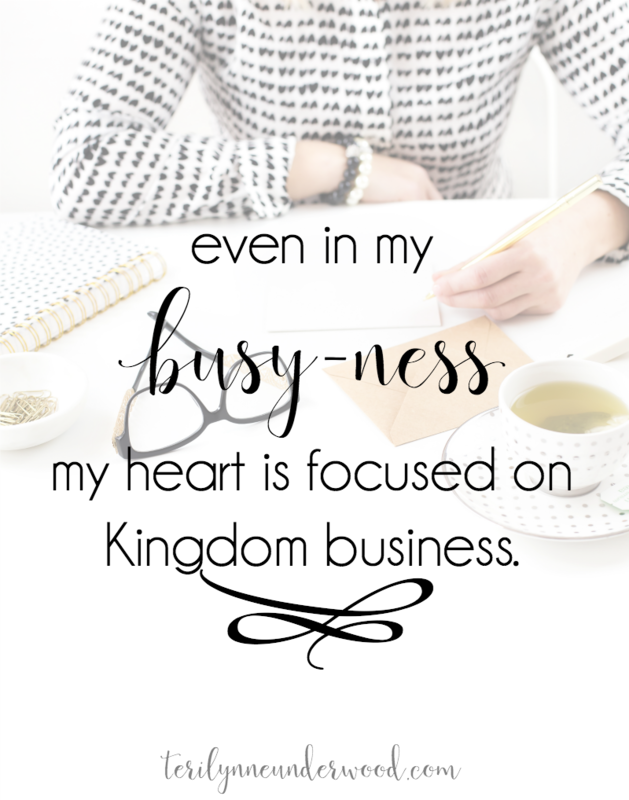 Even in my busy-ness, my heart is focused on Kingdom business. And, that, my friend, is what really matters. Over the next two weeks, my schedule is ridiculous. It really is. 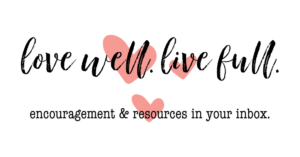 I have a book manuscript to finish, this blog series to complete, four other writing assignments due, and at least three books I need to review. Not to mention the laundry and meals, church obligations, and somehow managing to actually interact at least with my husband and daughter. You know why I’m not berating myself — because these things I’m doing are kingdom work! They are important and they are the tasks God has given me for this season. Not just the writing, but even more, the provision and care for my family. This is the place I am. Teenagers and husbands in ministry equal crazy schedules. Aging family members who need more support create additional responsibilities. Mentoring and investing in other believers takes time. Am I getting it all right? Nope! There are days and even weeks when I take on too much. And when that happens, I learn from it and ask God to give me wisdom to know when to stop and when to quit adding. TRUST THE LORD, EVEN WHEN IT DOESN’T SEEM TO MAKE SENSE. Here’s the thing, only you can know what the Lord is whispering to you. Only you can sense if He’s saying, “Pull back some” or if He’s leading you to step into a new season or a bigger responsibility or simply embrace the interruptions that can make your day more hectic. 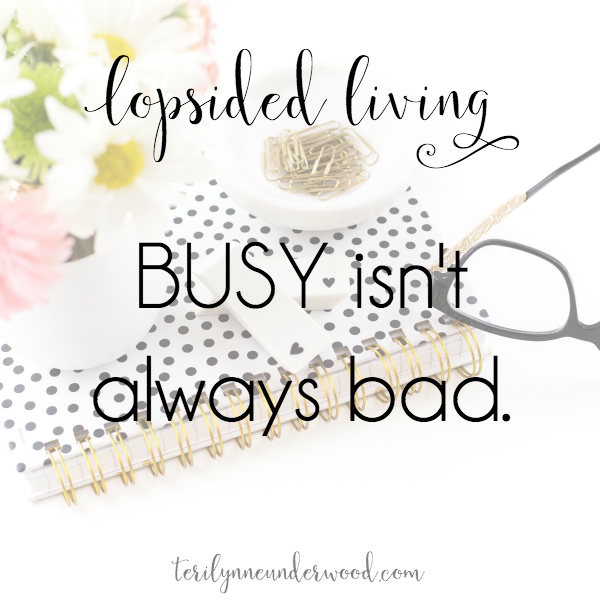 Coming tomorrow: Lopsided Living when you’re busy. Thank you, Isa, for your kind words. There is great value in being diligent, isn’t there? I’ve learned resting is much more fulfilling when it is preceded by the good hard work. Teri I read this the other week and shared it on my social media. Just read it again, and I can’t tell you how much I love this. I have thought these things so much but I guess never said them out loud. But you inspire me! I am always busy. Sometimes it’s good and sometimes it’s bad. I love that you said it! May I ask what your book proposal is about? Thank you so much, Jennifer! I have found such peace in not letting guilt get the upper hand in this area. I know I need to be mindful of the Spirit’s prompting to do or not do—but that guilty feeling doesn’t come from the Lord. 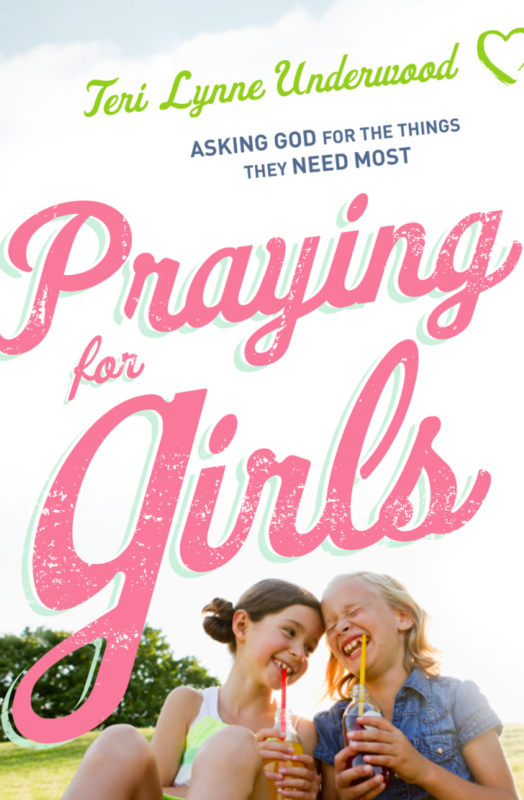 The book is titled “Praying for Girls: Asking God for the Things They Need Most.” I turned in the full manuscript this week! I haven’t started working on a new proposal yet but my agent and I have a pretty good idea what direction we want to go next. Thank you, again, for your encouragement!